This is my final year at college and I have been a little bit stressed knowing I have a bit less than two weeks until the school year begins. I feel unprepared and anxious for the year ahead. To help calm my nerves, I have been giving myself reminders and hopefully it can be helpful to share them with you! Make time for yourself. 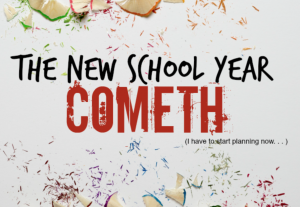 It can be too easy sometimes to get caught up in the work of the school year. The balance between homework, jobs, and socializing can be difficult. Do not forget the importance of time for yourself. Even if it seems hard to find the time, it is totally possible to dedicate at least ten minutes per day to de-stress. Make time for your friends. Along with having time for yourself, make sure to carve out time for your loved ones. Meet a friend for coffee for a half hour between classes, or get dinner after you’ve finished that big paper. You will feel so much better after seeing a familiar face and having a positive conversation. If you feel like you have too much schoolwork to go out, invite your friend over and you can study together! Communicate with your professors. After going through a mentally difficult semester, I learned the skill of communicating with my professors. Through a friend’s advice, I was encouraged to be honest with my teachers and ask for help when I needed it. I ended up explaining how I was struggling with depression and was offered an extension from a professor. They were kind and understanding when I reached out, which taught me not to be scared of opening up to my teachers about my particular difficulties. Remember what makes you happy. Visit museums, pick up new books, re-watch your favorite television series. Do what you love. Doing what you enjoy will be a great stress relief and can spark creativity. Do you have any tips to share that get you through stressful times during the school year? Feel free to share below! Previous story Online Diagnosis Tools: Helpful or Harmful?